On-Sale Now - Limited Pre Christmas Tickets. 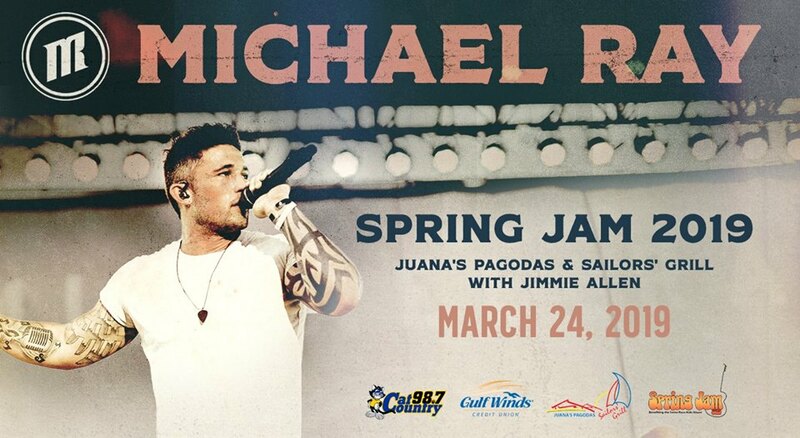 Cat Country 98.7 Spring Jam 2019 Starring Michael Ray with special guest Jimmie Allen to benefit Santa Rosa Kids House is presented by Gulf Winds Credit Union. The show is ONLY $10.00. Spring Jam is Sunday, March 24th on the BEACH behind Juanas Pagodas and Sailors Grill. Here is the best part Its for ALL THE FANS! This special evening with Michael Ray and friends is an ALL AGES show. There will be food and beverages on site. You can bring beach towels. Seating is first come first served.